I'm trying to make use of my TronXY XY-08N inductive sensor. This sensor works fine on my other Printer (RAMPS1.6 - 3 wire hookup), but relative to the Duet2 Wifi the instructions are a bit rough for me to translate for this sensor model. There really is nothing on the internet beyondhte Duet3D doc. I know everyone seems to push the BLTouch, but I'm really partial to this model of sensor and have never had issues with it on other 3D printer motherboards. I'm sure it will work on the DuetV2 Wifi as well, but I suspect I need to move a wire to some other pin elseware on the board. I have an image with my current wire connections (by wire color), but no joy. Any advice would be golden. @dc42 Thanks for the input. I was expecting to need to use other pins on the DuetV2 board, but would it be an option to use the 3.3+ and GRD from the Z-Stop head then use the Z Probe pin from the Probe head? I would prefer to not connect directly to PWR IN if I can avoid it. Also, is that diode on the Z Probe pin one I would need to add to the circuit? 3.3V isn't enough for that sensor, it says it needs 6V minimum. You can use an always-on fan output to provide the 6 to 36V supply, if the fan voltage jumper is set to VIN. I guess with the RAMPS you were giving it 5V. Coffee (or in American... Cofifee). Right, it does need more than 3.3V. Deleted my last reply as I see the following diagram has no diode so expect the previous link is using the built-in diode. 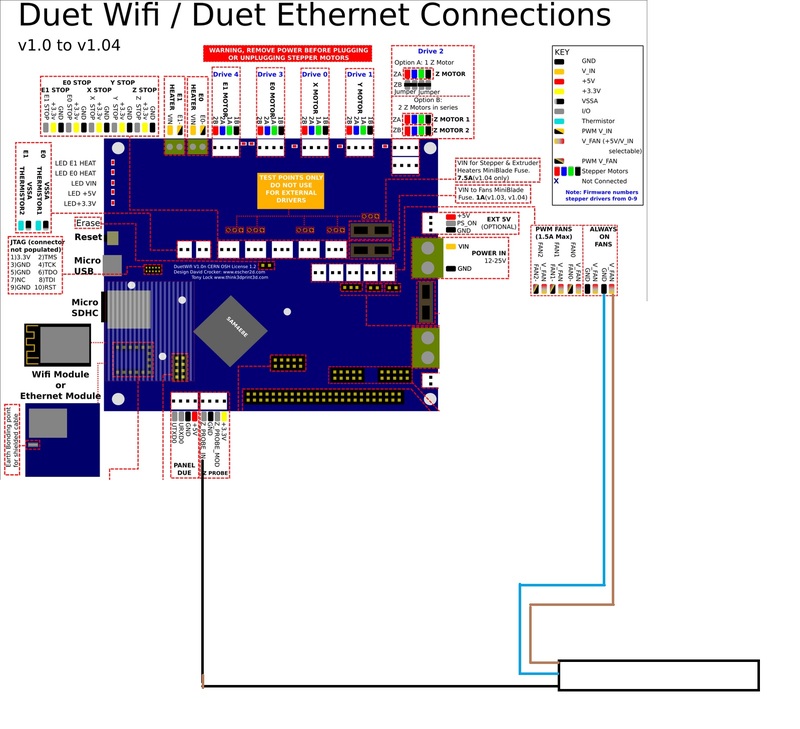 The diode is recommended when using Duet WiFi/Ethernet boards earlier than revision 1.04. Now I need to focus on my G-Code to make Home at bed center and set the probe. Thanks for all the valuable feedback and support you provide in this forum. @dc42 I'm at the point now where I'm testing my gcode for this and found that my TronXY XY-08N inductive z-probe is not working properly with my Duet2 WiFi using my Ultrabase hetbed by AnyCubic. With my RAMPS systems this combination works. I'm wondering if my cgode could be tuned better. As a test, I threw another aluminum bed on top of the AnyCubic hetbed and did a Home Z test and it worked fine, but with the AnyCubic, it seems the ability to sense the metal below is not working with my Duet2 WiFi controller. I have tried different T and F settings with M558 and also tried different P settings with G31. Please run the static test decribed at https://duet3d.dozuki.com/Wiki/Test_and_calibrate_the_Z_probe and tell us the results. @dc42 Thanks for your reply. Test item 1: With the Z probe deployed (if applicable) but not close enough to the bed to trigger it, check that the Z probe reading in Duet Web Control is zero or close to zero. Response for glass: Probe reads "0"
Response for Ultrabase: Probe reads "0"
Test item 2: If your Z probe is of a type that produces a continuous output when triggered (for example IR, inductive, capacitive and switch-type probes), hold a surface below the Z probe to cause it to trigger (or jog the nozzle towards the bed until it is close enough to trigger). Check that the Z probe reading in DWC is correct (about 537 for the Mini Differential IR probe, and about 1000 for most other types). Response for glass: My probe reads "1000"
Response for Ultrabase: My Probe reads "0"
PanelDue test sending G31: Results read same as above. I also sent M119 and read TRIGGERED for glass and OPEN for Ultrabase. Test item HomeAll: X and Y trigger correctly for both bed types. Response for glass: Probe reads "1000"
The settings above work perfectly with the glass bed. Using these settings with the Ultrabase, the Z-Probe never triggers using the Duet2 WiFi, but it does when I replace the controller with my RAMPS1.6. My question / concern is not if the Z-Probe works with the Duet2 WiFi, I have proven that is does work with my glass bed. I am trying to find the right g-code solution to have my Z-Probe work with the Ultrabase as it did using the RAMPS boards and Marlin F/W. With my glass bed, the lights are on and everyone's home. With the Ultrabase, the lights are off and nobody's home. In my opinion, I'm seeing the Ultrabase must be blocking out enough of the return signal to have it not register. So either a timing issue (maybe a gcode setting) or power level to the sensor. It's not the end of the world as I actually like my glass bed more than the Ultrabase because glass is easy to clean without accetone, but I'm researching hotbeds for a new printer and really just perplexed why this combination works with RAMPS, but not Duet.